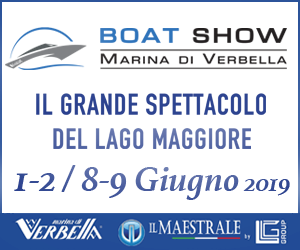 «I made 24 different models of hulls before deciding on the definitive one», says Marco Lostuzzi. He’s talking about the 46, the first long cruise boat made by Cantiere del Pardo. 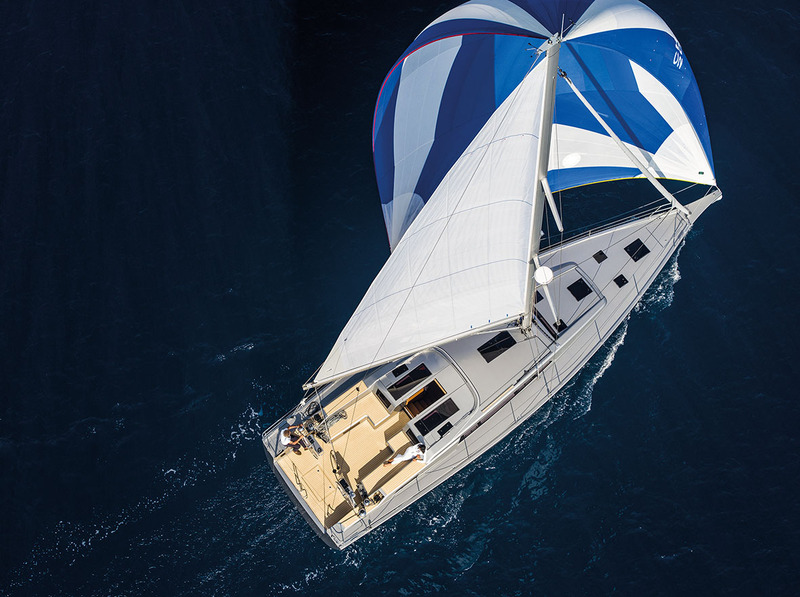 The success was so great and came so quickly that the commission for a new boat appeared: the Grand Soleil 52 LC. The goal was the same. To make a cruise boat which was faster and performed better than the competition. 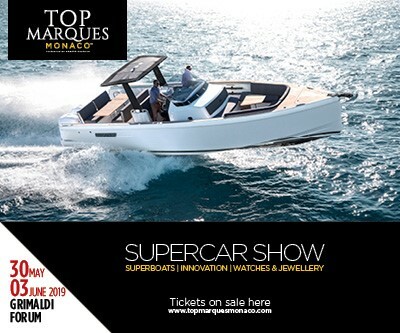 While we tack along the coast off Monte Argentario, the designer tells me what the real difference is, apart from the length, between the two boats. «I worked on the prismatic coefficient: I narrowed the bow to help the 52LCmove even when there isn’t much wind. And then I moved the mast aft a bit, and so the jib, even though it is self tacking, still has a sail area that is more than sufficient». What we are sailing on is a kind of “hybrid” version. That is how the owner wanted it. It is hybrid in the sense that it mixes together elements from the two versions offered by the yard. 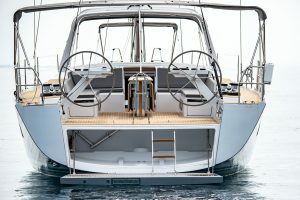 The Grand Soleil 52 LC “Cruiser” has a rollbar with the awnings enclosed within it, and which mean that you can find shade from the sprayhood on the deckhouse right up to the cockpit, while the “Sport” version has sails and fittings which are more “tightly drawn”. 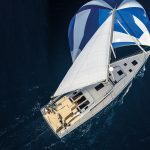 The owner of this model chose a Performance with tall rig mast and rod rigging, but didn’t want to get rid of the rollbar, the self-tacking jib or the furling mainsail, because he basically sails it with his family. The conditions that we find off Cala Galera look as if they have come from an advert for sailing: sun, calm sea and a wind of between ten and thirteen knots.I imagine that if a salesman wanted to sell a boat, he would like a remote control with a button you press to make a day like this appear. I don’t have to buy anything, so I will just enjoy the sailing. And the feeling at the helm is really pleasant. It’s a quick boat. Neither excessive nor nervous. It is the kind of speed that comes from getting the waterlines right, and the sail plan too. Close hauled, with the main sails set, we go at eight knots. And with the Code 0 up it gets better still. It is a boat that never makes you want to start up the engine. 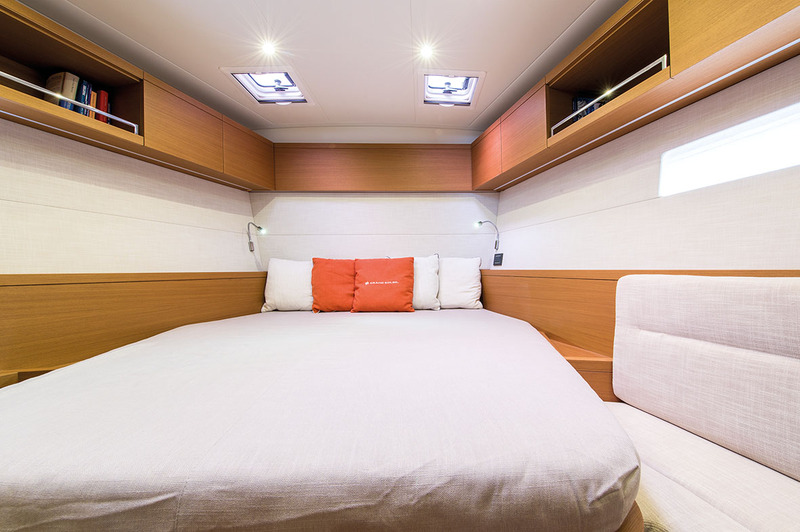 The Grand Soleil 52 LC is easy to handle, the helm is comfortable and never too hard. «The rudder blade has a large surface area», Lostuzzi explains to me, «it was designed that way to ensure that the boat is responsive. We wanted to create a reactive boat, but one that was never hard work». And they achieved that very well. And, perhaps for the first time, I also appreciate the self-furling jib. Without bothering anybody, I continue to tack, but we really have a lot of sail up thanks to the mast being brought slightly aft. That way the boat doesn’t lose any performance. I realise that when I see the SOG on the plotter. All we need is ten knots to sail at between six and a half and seven. And it handles well, even when it comes out of a turn, because it never loses speed. The handling is still good when hit by a gust of wind, because it doesn’t flatten out. It is all very well balanced, just as a cruising model should be. The speed is very high, even when using the engine. Also, it isn’t the standard 80 hp engine, but the in-line Yanmar 110. Without forcing it, it manages to get the 52 LC up to 9 knots. Which is inversely proportional to the noise level, which is never excessive. Engine rotational speed between 2500/minand 3000/min, the aft cabins register just over 70 decibels. 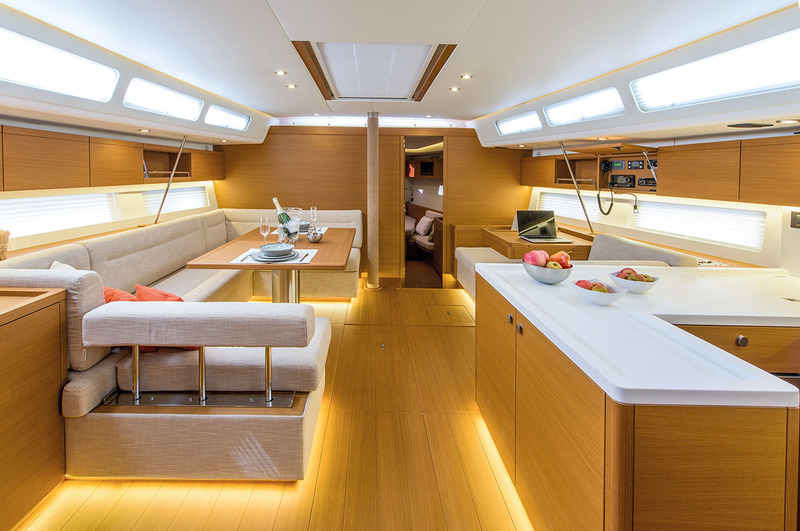 The low noise level isn’t the only good thing about the interiors, which are carefully designed – like the deck – by Nauta. There is excellent natural light from the windows and portholes which are almost everywhere in the deckhouse and the cockpit. 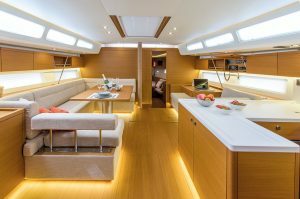 It’s also a nice feeling that you get in the dinette when the boat is at an angle. That comes from the small windows on the sides of the hull, which are set very low and so easily end up under the waterline. 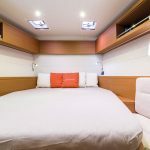 The three cabins, two of which are in the stern, while the owner one is in the bow, are all generously proportioned. The result is nearly surprising if you take into account that right in the bow there is a crew cabin which is most definitely large and comfortable, and right in the stern there is a garage for the tender. And all this is on board a boat that is 16 meters long. The only flaw is probably in how the galley floor has been taken down a few centimetres. The advantage lies in having greater space when you are cooking, but the disadvantage is having a small step there, and until you get used to it, you are in danger of bashing your toes more than once. 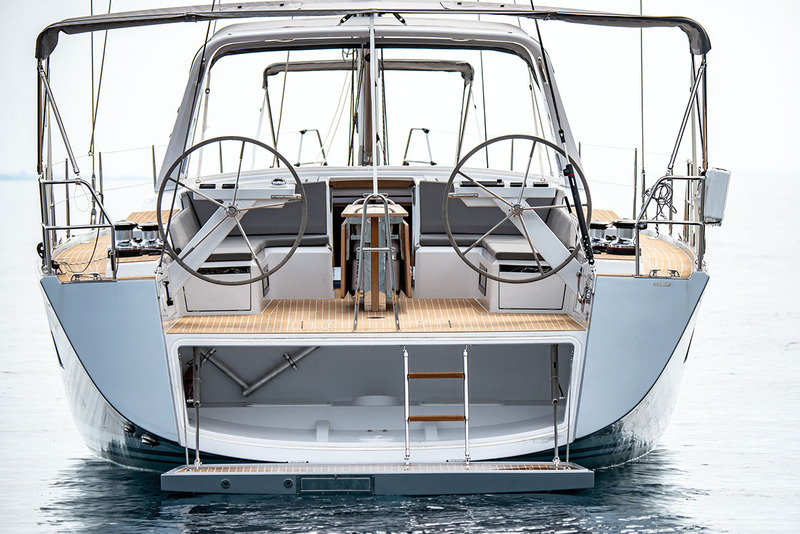 The Grand Soleil 52 LC deck fittings are done for comfort and ease of handling. 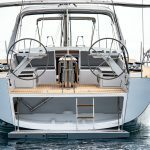 The winches are all electric and easily to hand, and – together with the self-tacking jib and the furling mainsail – really make it possible to sail it single-handed. The rollbar also means that you can get rid of the mainsail travellers and sheets from the cockpit. 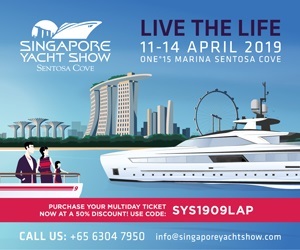 The stern bathing platform can be opened up and you get to it easily thanks to the split backstay. You can get around easily on board, including along the gangways. The high shrouds are fixed to the hull and the low ones to the deckhouse, so the gangway is all clear. In the bows, the comfort is motor-boat style because there is a sun area with an awning that folds away. The other characteristic to be appreciated is the sprayhood which is split in two horizontally. The lower part can actually be taken away, so that you get the shade in the part of the cockpit which is further aft, but the circulation of the air is not blocked. 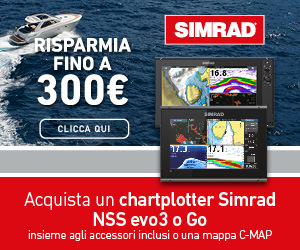 That is perfect for sailing in the Mediterranean during the summer.